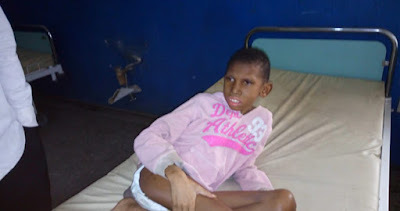 A 14-year-old boy, Steven Orode diagnosed of Cerebral palsy and acute malaria has allegedly been abandoned by his mother at the Central Hospital, Warri. The hospital’s Public Relations Officer, Mrs Success Obere told newsmen yesterday in Warri that the teenager was admitted on December 12, 2017. According to her, the mother of the boy absconded shortly after the boy was diagnosed of the ailment at the hospital. Obere said the woman had told the nurses on duty that she was going home to get some things and detailed a friend who accompanied her to the hospital to look after the sick boy. “After waiting patiently for the woman, the lady also left. “We have called all the contacts the women gave but she is not picking. We also called another line but the person denied knowing the woman or the boy. “We reported the issue at the “A” Division in Warri and the Divisional Police Officer assigned the Police Social Welfare Unit to handle the case. “The hospital attempted to admit the boy into the orphanage in Warri but he was rejected on the ground that he was seen as physically challenged,” she said. Obere however said the boy’s health was improving and appealed to the parent to come forward. Also, Mrs Bridget Achugbue, the nurse handling the patient said the boy had successfully been treated of malaria. What a sad situation.